AstroTech AT10RC and Celestron CGE Pro – First Light! 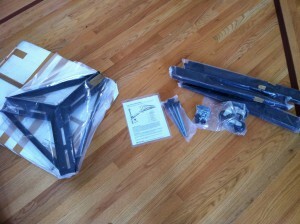 Three weeks ago I went ahead and ordered what I hope becomes my new base platform for deep sky imaging. But this is no toy: This is 300 lbs of serious equipment! 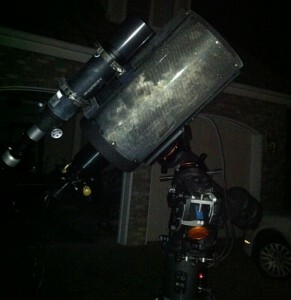 A carbon fiber AT10RC, CGE Pro mount, and an Orion 80mm ED for guiding. There are a few different reasons for this overall selection of equipment and even though it’s done, documenting it seemed like a good idea. That way when we have clear skies again in a few months, I can remember what I was thinking! 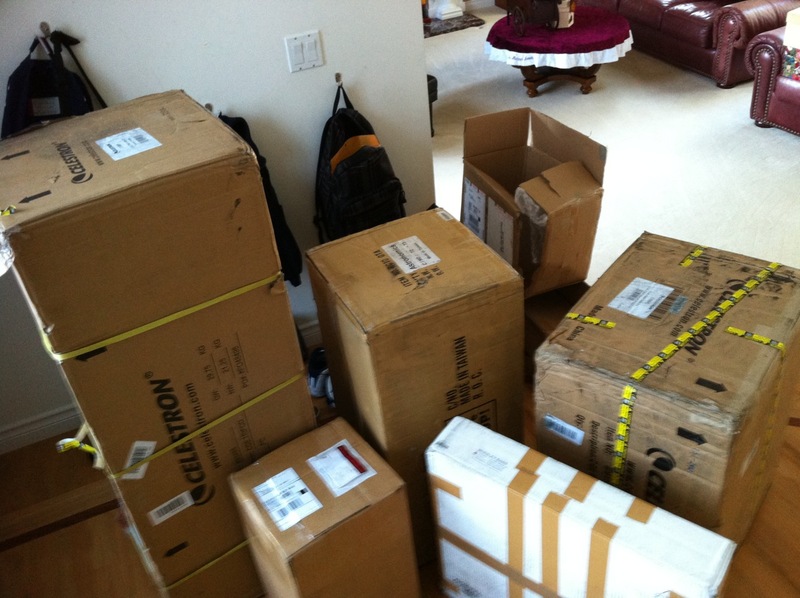 UPS Drops Off The Boxes! First, the Celestron CGE Pro is rated at a capacity of 90 lbs – much more than I will be using. This will allow me some flexibility for a larger OTA in the future (I hear the AT12RC and AT16RC aren’t too far away, maybe as soon as January 2011! ), and also will provide fantastic mount tracking (it’s rated at 9 arc sec from the factory, and can be reduced further with periodic error correction, or PEC). Another benefit is that since I have already the CGEM and CPC 1100, The handset controls are already familiar to me. Unlike the CGEM however, there is no polar alignment scope option, which I was originally concerned would make alignment challenging. 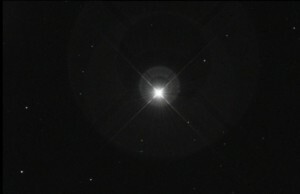 The Celestron solution is the use “All Star Polar Alignment”, about which more later. While heavy, the mount head does come apart into two separate pieces to make it easier to transport. Or, if you prefer, the mount is transportable, but I don’t know I would call it portable. One word of caution to CGE Pro dreamers: I have smashed fingers on this mount a few times and it is unpleasant. There are a lot of places that look save until something rotates about. Be careful! Luckily, there is a solution for “local portability” in the form of JMI Wheeley bars. JMI Wheeley bars are nothing more than a platform with wheels on it that a tripod sits on top of. Think of it as mobilizing your tripod! And having officially used them now last night, I can tell you they are a must have for the CGE Pro if you aren’t planning to permanently place the mount on a pier! With the my other two scopes, I generally pick them up in pieces and reassemble them where I’d like them to be – but now I can just roll my scope in and out of the garage. I was surprised how much faster I felt my “setup” time was just because I wasn’t making as many trips back and forth. All was not flawless, however. I am pretty sure I must have ordered the wrong bars: The wheels on these bars are very small (and hard plastic). They rumble horribly on my aggregate driveway even though I see there are pneumatic wheels also available. But perhaps worse was that in the most collapsed form, the CGE Pro tripod needed it’s legs extended well over 18 inches just to fit into the bars. Like any eager and entrepreneurial astronomer, I found solution in my brother-in-laws shop in the form of a metal saw. I assure you the bars are thick, durable, and hard! We went through a few drill bits moving some of the screw-holes, but eventually had it to where the tripod legs are only extended about an inch or so. This is actually useful for leveling anyway, so now it’s just perfect! So, why did I chose to go with an AstroTech 10 inch Ritchey–Chrétien? Given that I have already a fabulous Apochromatic refractor for wide field imaging (the Televue NP101is), and a large CPC 1100 Schmidt-Cassegrain primarily for visual, the AT10RC fits right in the middle: imaging smaller objects and smaller fields. It also offers solutions to many nuiances I’ve encountered with other scopes previously. For example, I have had issue with temperature based focus shift occuring in both of the other scopes. A carbon fiber shell and a quartz mirror help to compensate for this focus shift as these materials are both much more tolerant to temperature change. The AT10RC is also paired with an awesome Feathertouch 10:1 focuser. Given the fixed-primary mirror Ritchey–Chrétien design, moving the camera/equipment to achieve focus is a much friendlier mechanism than moving the primary mirror around as one does with the Schmidt-Cassegrain design. The Ritchey–Chrétien design also has one other interesting benefit: lots of backfocus. In fact, the AT10RC has nearly 10 inches of backfocus! This means your imaging train can have a lot of stuff mushed in there: active optics, filter wheels, off axis guiders, reducers, flatteners — the works! There is nothing more sad than stick accessories into the imaging train only to realize you haven’t got enough backfocus left. The AT10RC comes with some giant spacer rings as well – and I was surprised that right out of the box I was able to get a simple prime focus camera operating with little fiddling about. Lastly, there’s also a camera consideration here: the Orion Starshoot Pro v2.0 has pixels that are just over 7 microns. For imaging, it is important to match the pixel size of the camera up with the focal length one is using for appropriate seeing to avoid dramatically oversampling (or undersampling). By binning 2×2 with this camera, this brings the size up to about 15 microns – which is just below where we’d really want to be with one arc second seeing conditions. I wanted to achieve a few things on the first night out, mostly along the lines of figuring out how everything is going to work. Balancing scopes usually isn’t too difficult: lock one axis and unlock the other. Then, gently swing the scope along that unlocked axis and adjust the weight so that the motion is fluid and it doesn’t swing back like a pendulum. Then do the other axis. The only real trick here is sliding scopes along dovetails and counterweights along the counterweight bars. Watch fingers here: it’s easy to smush them! This only took about five minutes although the 80mm guidescope had to slide down quite a bit. Alignment of finderscopes is usually not too challenging – Often I just find a semi isolated, outrageously bright star (like Rigel), or a nice binary star (like Mizar/Alcor). This makes it easy to see when you are looking at the same stuff. On the AT10RC OTA, I used a 20mm illuminated reticule to see what was going on there rather than a camera. Often I will also hold a green laser pointer against the telescope tube (or rails) and use that to get a general direction – but (and I never noticed this before), my laser apparently don’t shoot straight along the axis of the part you hold in hand. In other words, the lasers shoot crooked! At first I was pretty amazed to see everything “appear to move” so much until I rolled the laser and noticed it drew a giant circle in the sky. I have two of them, and they both do (though one worse than the other). I don’t see any way to fix that, so I just did my best guess. This process took about fifteen minutes. Aligning the 80mm guidescope turned out to be far more challenging, and it’s still not quite right. Unlike the finderscope, this scope is not collimated with little screws. Instead it is clamped down with Parallax Rings and bolted rigidly the the dovetail on the AT10RC. This leaves virtually no room to adjust the scope position. I fiddled around trying to tighten/loosen some of the clamps and bolts but nothing will give it the amount of movement I need. While irritating, this probably isn’t that big of a deal as eventually I will move to an off axis guiding solution. Next I moved on to finding focus with my camera. While not parfocal with the crosshair eyepiece, it’s not too far off either. It only took a few minutes to get a reasonable focus (for poor seeing conditions, a FWHM around 4 seemed to be the best I could achieve. Focusing with a drawtube (the Feathertouch that comes with the scope) is a real pleasure compared with the mirror-moving SCT’s. Again, this was part of the reason I chose not to go the EdgeHD route, and I was pleased. 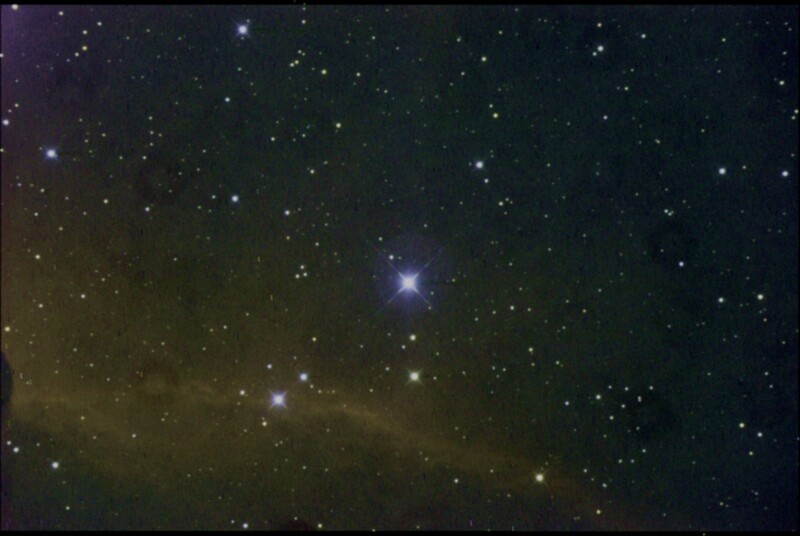 I took a few short exposures of Rigel (remember, I hadn’t properly aligned so there is no tracking here), and put together a few 15 second exposures as the official first-light image. At this point, I realized I was going to have to go through the alignment process. When I rolled the scope out, I intentially tried to point it’s axis towards the celestial north pole, but this was done holding my IPhone in one hand with the “Compass”. In other words, it was not going to be polar aligned very well! Recenter the same star with the Alt/Az controls on the mount. The handset will tell you in big letters: “DON’T USE THE HAND CONTROLLER TO MOVE THE MOUNT”. Remember, the idea here is that we want to get polar alignment which means the actual axis of the mount must move! The manual falls a bit short of emphasizing how important it is then to go back and recalibrate for the GOTO’s to work. At this point, you’re tracking, but you’re not GOTO’ing! So I went back and re-found my original two-star alignment stars and replaced them with their new positions. Of course, it’s okay to use the hand controller at this point. Finally, I wanted to see if PHD Guiding would work with the 80mm guidescope, or would there be too many issues with flexture and all of the other things people always complain about with longer focal lengths. On the first try, it calibrated quickly and began guiding. I took a few swats at Alnitak (apparently I missed and got HIP 26713 instead), hoping to pick up some of the nebulosity nearby — with five minute exposures. I expect that the next night out I ought to be able to hit up some deep skies. Which DSO should I try to image? EDIT:: It’s now August 24, 2011. A good eight months after the first light, I’m happy to report this scope stands up to everything, bar none! Here are some of the things that are just wonderful in comparison to my other two scopes, the NP101is and CPC1100. Monster sized Feathertouch focuser. Not only does this make it easy to get super good focus super fast, it is pretty temperature resistant. Yes, there is a little bit of temperature based focal shift, but it’s not a lot. The carbon fiber tube probably helps here too. One or two adjustments through most nights – which are the most gentle touch on the 1:10 knob are more than enough. No dew! The open face tube acts like a huge dew shield. The fans probably help a bit as well, but this is in stark contrast to the my other two scopes. The CPC1100 almost always need the dew shield (or hair dryer)! Cooling fans can be left on all night without introducing any vibrations. The quartz mirror and open tube also equate to very fast cooldowns. No more waiting two hours with the CPC! Diffraction Spikes! Yes I like them. They add a lot of character, and tell you when you’re losing focus very quickly. 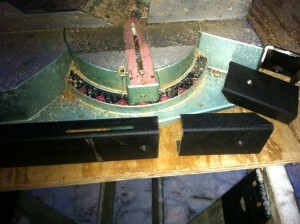 While I have read and heard stories of collimation hell, I’ve not yet seen any slippage that warrants playing with it. No mirror flop. It can point anywhere at any time and track all night long. No funky mirror locks to play with, and it’s mounted rock solid to the base. Love it. Decent flat field, f/8. f/8 might be a little slow for some people, but it’s not that bad. Given the scopes size, it collects up a good slug of light for that ratio. Plus the field is generally flat enough to work on my APS-C sized chip without any extra adapters. Backfocus. Tons of it… Almost 10 inches. Feel free to stick whatever adapters you need in your imaging train. You can put it all there and still have no problems reaching focus. I haven’t found enough stuff to put on my imaging train yet to eat it all up. Price. What’s not to like? Similar scopes from other manufacturers have extra digits in their price! My biggest complaint is that [i]it’s[/i] not bigger. AT16RCF anyone? If you’re looking for a rock solid imaging scope, I’d strongly encourage you to grab this. You won’t be disappointed! This entry was posted by admin on December 4, 2010 at 7:48 pm, and is filed under Equipment. Follow any responses to this post through RSS 2.0.You can skip to the end and leave a response. Pinging is currently not allowed.